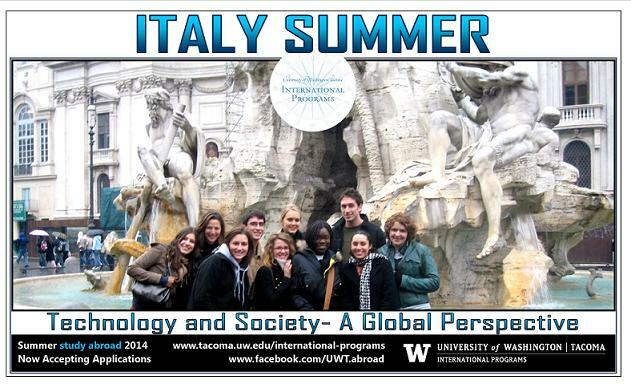 Time is running out to apply for the Italy program taking place this summer, entitled “Technology and Society: A Global Perspective.” The application cycle will close on MONDAY, APRIL 21st at 5 p.m. This program offers 12 CREDITS in one of the following courses of YOUR choice: TCOM 498 (Communications), TINST 493 (Technology), or TGH 399 (Global Honors). Based in Rome, the program includes trips to Naples, Florence, and Milan to study the cultural implications of Italy’s advances in technology and media throughout the ages. Examinations of the remains of the Roman Empire, as well as visits to several important historical and technological museums will be a part of the overall curriculum of this intriguing 4-week program. This exciting opportunity begins on June 23rd and ends on July 24th. The program fee is $5,800 and includes the course fee of 12 credits, all housing and lodging during the program, all transportation costs for field trips, as well as the entrance fees for all museums and historical site visits. Financial aid and scholarships are available that can be applied towards the program fee and other study abroad costs.